Northern Thailand | Mmm, Hello! 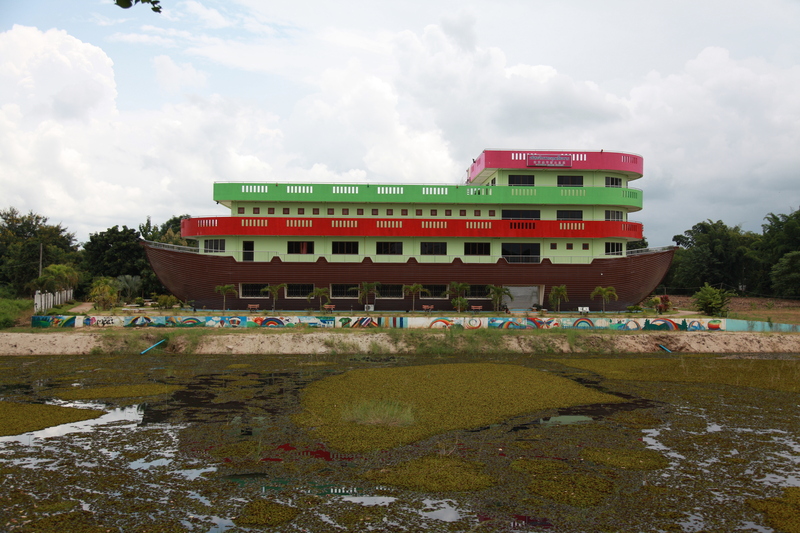 A few days ago we were cycling along the Mekong River path when Dom pointed out a small sign attached to the side of a building on stilts which read, ‘Yoga’. Curious, we climbed the wooden steps leading to an entrance, only to be greeted by a Thai lady who pointed under the building and said, “That way”. The space underneath felt like walking through someone’s cluttered garage with lots of doors on the right hand side, and hammocks hanging from beams in the ceiling. The garage then opened out onto an overgrown garden area, and a series of steps with metal bottle tops embedded into the concrete like a mosaic. Once at the bottom, we finally came to a sign attached to a door which read, ‘Cheeky Monkey Yoga- This is it’. After several knocks and an overly excited greeting from 2 dogs with big ears, a smiling lady in her late 50’s/ early 60’s opened the door, introduced herself as Diane (or Mokshadharma – her Yogi name) and invited us in. Di-Mokshadharma’s home/ yoga studio was a beautiful, airy, open plan space which looked out onto the whole of the Mekong River and Laos. She explained that her and her husband had moved from Australia 5 years ago to live in Chiang Khong, and she’d been teaching yoga for 20 years, but now offered 1-1 classes for travellers. We visited again yesterday to do a class in the evening. Bamboo mats and embroidered cushions had been placed out by the large open window overlooking the river at sunset, and candles flickered around the rest of the room. The yoga was incredibly relaxing and one of the best classes I’ve had. However, equally as interesting was how Di-Mokshadharma and her husband came to live there. I had no idea that it wasn’t possible for non-Thai residents to own property in Thailand. Di-Mokshadharma and her husband’s home did not technically belong to them. The garage like room we walked through on the way there was actually part of a hostel, and 5 years ago the space that is now their home had been neglected and was pretty uninhabitable. With permission from the hostel owners, they then did up the neglected section which is now not only their home and yoga studio, but also a space where they voluntarily teach local kids in the area English. In return, they only pay the relevant bills for their section of the property, and are involved with other developmental work in the community. I’m not really sure what you’d call this- Perhaps just a friendly agreement? I’ve certainly never heard of anything quite like it, but I love the idea. 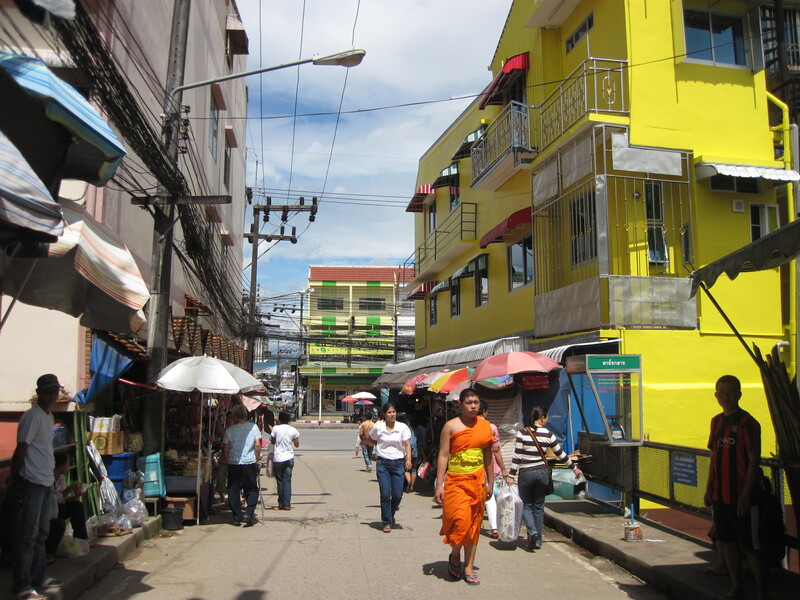 Mae Sai, Thailand’s northernmost market town on the Burma border feels a bit forgotten about. I think there are only 5 tourists including us in the whole place. Despite the fact that there isn’t much to do here, the surrounding countryside is beautiful and the town is quite intriguing. We were walking down one of the side streets one evening, and all the houses seemed to have shutters like the fronts of shops. They were all open and you could see right into people’s living rooms. It felt like I was walking past lots of intricately designed theatre sets showing snippets of everyday family life in Thailand. 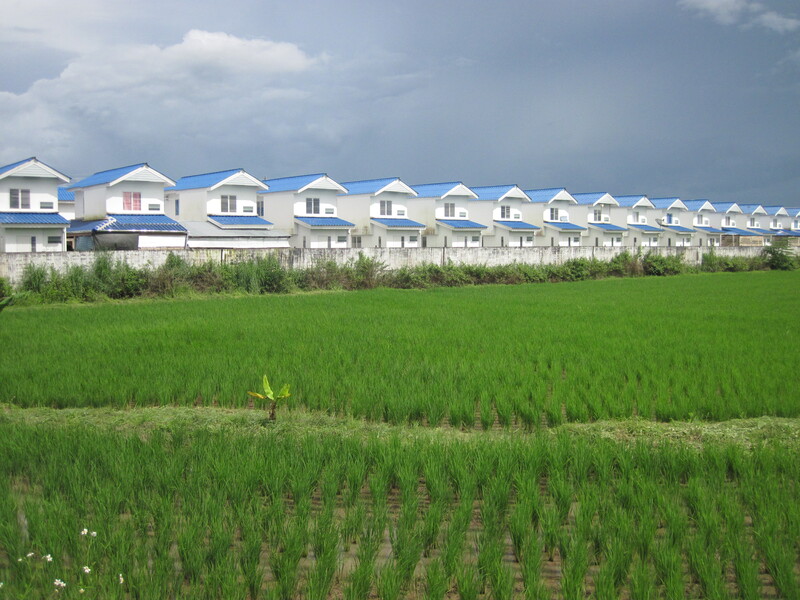 On the subject of houses, whilst driving along on a hired moped to explore some caves a bit outside of Mae Sai, we passed a bizarre clone like housing estate with identical red houses on one side of the road and blue on the other. They just didn’t look real and certainly not what I was expecting in the middle of the Thai countryside. However, the main attraction of Mae Sai is not its houses, but its position on the Burma border, but we didn’t venture over. One day passes are no longer available, and tourists who do choose to cross over the bridge are not allowed to stray outside of the immediate border town without paying extra money and being closely watched. Instead, we found some rickety metal steps which lead up from the Mai Sai market and through what looked like a small block of higgledy-piggledy flats which opened out onto a flat roof. I’m not sure if this was supposed to be a designated viewing point or not, but it was a good one. Once on top we had a pretty good view of both Burma, Thailand, the surrounding hilltops, temples, and the tiny slither of the Mae Sai River which acts as the natural divide between the 2 countries. As we left a family on the Burma side waved and blew kisses at us from their house across the river. We’ve been staying in the jungle just outside of Chiang Rai for the last few nights. After almost getting lost in the dark we returned back to where we were staying, to find out that earlier in the day the people who own the guest house we were staying in had slaughtered a pig. One of the other guests had said, “They killed it right in front of everyone cutting through all the bones with a machete.” The meat would then be shared with everyone in the surrounding village/ tribe, and none of it would be wasted. After we’d eaten dinner that night one of the local Chiang Rai jungle trekking guides offered us some home-made corn whisky from a plastic Coca Cola bottle. As we sat down at one of the nearby tables to accept the offer, I noticed some sort of bruise coloured, bloody animal part lying on a tray next to the whisky. Apparently it’s traditional in northern Thailand to eat all parts of a pig once it has been killed. There is also an ancient Thai ritual which involves mixing the raw contents of a pig’s bladder with whisky, and drinking it before bed to cleanse the body for the morning. It’s also supposed to be a good remedy for back pain. The Portuguese guy sat opposite us had already tried some of the concoction and said, “You can still smell the remnants of it from the empty glass.” It smelt a bit like strongly smelling feet. 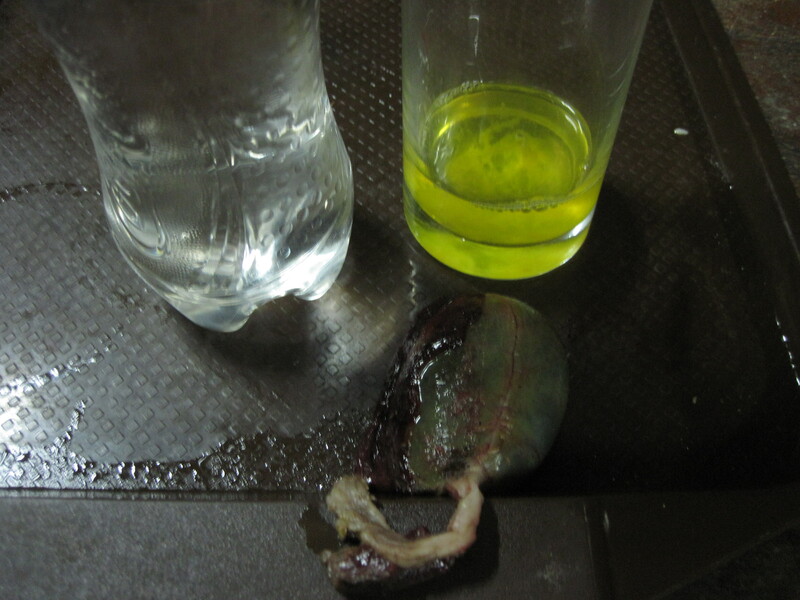 The trekking guide added, “When you drink this, it makes you a real man.” I asked him how to make some which involved squeezing the bladder over a glass until fluorescent yellow liquid spurted out. About 2-3 teaspoons is enough for one dose. The mixture is then topped up with whisky and downed. Having no interest in becoming a man, I cautiously tried a tiny sip out of curiosity. It was probably one of the most disgusting, bitter and horribly smelling drinks I’ve ever tasted! After I’d finished, the Portuguese guy and the trekking guide halved the left over mixture, clinked glasses and polished off the lot between them. I dread to think what the after taste of a whole shot would be like. From now on, I think I’ll just stick to plain whisky. We were winding our way through this maze like market today which sold everything. I was quite enjoying soaking up all the different colours, smells, sounds… until I reached the alive animal section. There were hundreds of fish swimming in tiny bowls, birds in only fractionally larger individual cages, and piles of turtles squashed inside small buckets of water. I asked the woman how much one of the turtles would cost but she shook her head and said, ‘No sale’. I wanted to buy some of the animals, load them into a tuk tuk, then ask to be driven to a nearby lake so I could release them. I wonder how long I’d have to spend in a Thai prison for stealing animals. After a 3km cycle through some nice flat countryside we reached the first cave. Down a track with abandoned huts down one side, the atmosphere was pretty spooky. A monk greeted us with no English and signed that we could go up this worn looking stair case. With Clare in front it felt as if this was some old spooky temple (which it half was) and we were about to steal some precious jewel after dodging a few ancient traps and shooting bats. And yes, there were actually bats in the cave way above where my touch beam could reach into the darkness of the main cavern. After running out the cave screaming with a flock of bats in pursuit… well not really, we carried out towards another “Buddha Image Cave”. 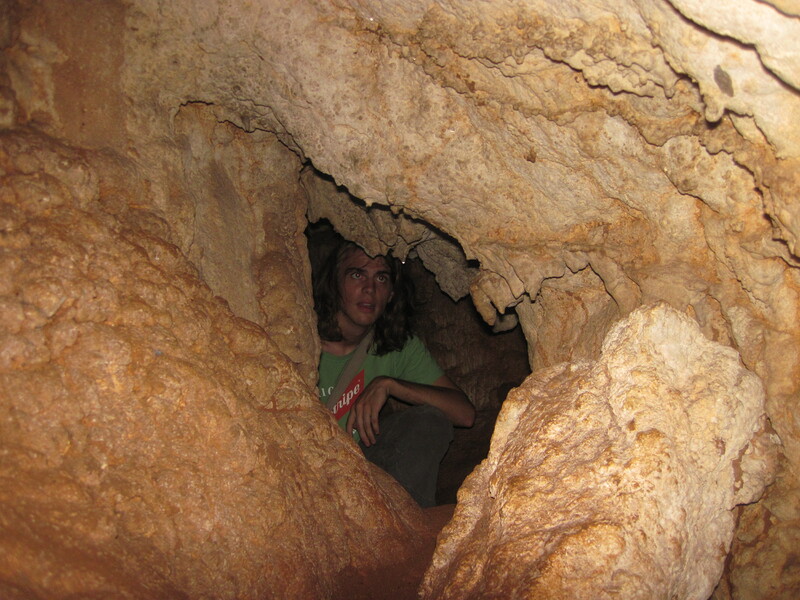 This cave was some how less impressive and felt more like a hollow in a rock wall. The resident monk in this place was pretty nice and obviously didn’t get many visitors. He took us through every ritual and got us to pose for a picture in front of one of the statues. We decided that even though we had seen what we come to see the countryside alone was much more worth the time. With this in mind we continued up the road steadily getting deeper into the countryside. The views were pretty incredible and a light warm rain kept us going. We happened upon a sign saying there was a hot-spring 12km away, with no other real aims we decided this must be where we needed to go (after a small disagreement of “You REALLY want to go to a tourist elephant village along the main highway?”). This route lead us across a huge swelling river, up through mountain villages, over red mud slide covered roads and past smiling/waving villagers. After a distance that felt way over 12km (I swear it took us about 5 minutes to do 3km then 2 hours to do 1km, according to the signs) we arrived at the hot-spring. The bubbling 87degC water, smelling of eggs, with pipes running into a pool… that was closed. It was now around 4:30pm and it would be getting dark soon. From what we could tell it was about 20km+ back to Chiang Rai. We needed to cover some serious ground back as we had no lights and our map was pretty much useless out this far. 8km later we were exhausted with some huge hills still to go (remember we had no gears) things were looking a little sketchy. Its worth pointing out at this point pretty much the only vehicles we saw on the road (which only seemed to be every 30 mins or so anyway) were motorbikes or 4×4’s. Behind us I heard the deep rumbling of a vehicle, looking round I saw heaven… a pickup truck. Madly flailing my thumb out and waving frantically the vehicle stopped on the side. I pointed down the road and simply said “Chiang Rai?” hoping that would be obvious. He pointed and gave the thumbs up, we chucked our bikes in the back and pretty much flopped into the back with them. At last, now we would get somewhere, even if it was not all the way. But after only 5 mins of traveling we stopped in a village I really didn’t remember passing. The driver and his passenger got out to a road side ‘shop’, pointing at a bottle of something and then motioning to us we realised he wanted us to drink with him. They paid for a shot of this white clear rum(?) topped off with a fruity/cherry/red stuff mixer. It was actually pretty nice and wouldn’t accept me paying for any of the drinks at all. In the end they did drop us on the outskirts of Chiang Rai and it was only a short cycle to our hostel. It really is true about the kindness of strangers out in the rural parts.